It’s the 1986 World Series. The Boston Red Sox and New York Mets are tied in extra innings. Bill Buckner, Boston’s first baseman, has a very easy, slow ground ball hit to him. If he makes the play, the Sox win the World Series. But he doesn’t. The ball goes through his legs and this play goes down as one of the worst chokes of all time. Choking. How can athletes overcome it? At game time, the simple solution is to channel all your mental energy into one action. In other words, the answer is focus. I’ve heard from a lot of athletes who have trouble focusing under pressure. They tell me that a voice in their head starts creating doubts and worries, which triggers a nervous feeling. That feeling sets them up perfectly for a choke. Let me suggest to you right now that you already have some ability to focus your mind. You just have to become aware of the fact that you use your focus ability in other areas of your life and that you can bring that ability over to competition. Here’s an example: I regularly conduct workshops with youth sports teams for players as young as 11 years old. At one particular wrestling team talk, I asked the boys if they had any trouble focusing before or during their match. They all raised their hands. “About five minutes,” was the consensus answer. “And about how long do you play video games for?” Some of them admitted to playing for hours without being distracted (the parents in attendance attested to that). I could almost see the lightbulbs going on. Here’s the good news: You really only need that focus ability for a short time when under pressure to avoid the choking. You don’t need to focus for an hour like when you play a video game. And you can practice recalling your focus ability in many areas of your daily life. Just notice how you do it and what your thinking is when you focus. Do you focus when watching your favorite TV show? Do you focus when reading a good book? Aren’t you having as much fun in your sport as playing a video game? See how easy it is that you naturally know how to focus when you’re doing something you enjoy? This is what keeps that little voice in your head silent. There are endless opportunities for you to practice your mental toughness so that when the game is on the line, you come through with that trophy raised above your head! 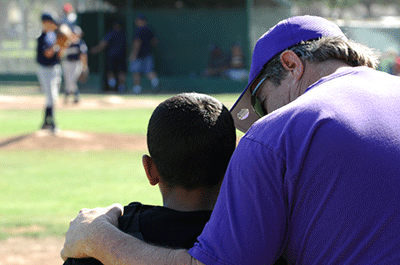 Craig Sigl’s work with youth athletes has been featured on NBC TV and ESPN Sports Radio. His free ebook: “The 10 Commandments for a Great Sports Parent” and also a free .mp3 guided visualization to help young athletes perform under pressure can be found at MentalToughnessTrainer.com.